I made sure my NYC trip this month had a bit of extra time for exploring. I wanted to look for some "small space" bedroom furniture ideas for a specific project. I really need to get motivated to look for some new clothes and I need to find a new backpack that I like. It is Fall, so still warm enough to wander outside and window shop, look for free concerts, and generally people watch. Day 1 ended with mixed feelings. I did get a doughnut at BabyCakes - now just known as Erin McKenna's Bakery. As I remember, everything is too sweet but that did not stop me! I walked it off though strolling along Spring Street across town. I didn't find the type of shops I was looking for but it was a nice, if hot, walk. I also got checked into the conference. Glancing around I saw more business casual than Tshirts. Even more than a RH Summit event. Not sure what I am getting myself into here - I must be getting too used to "geek casual". 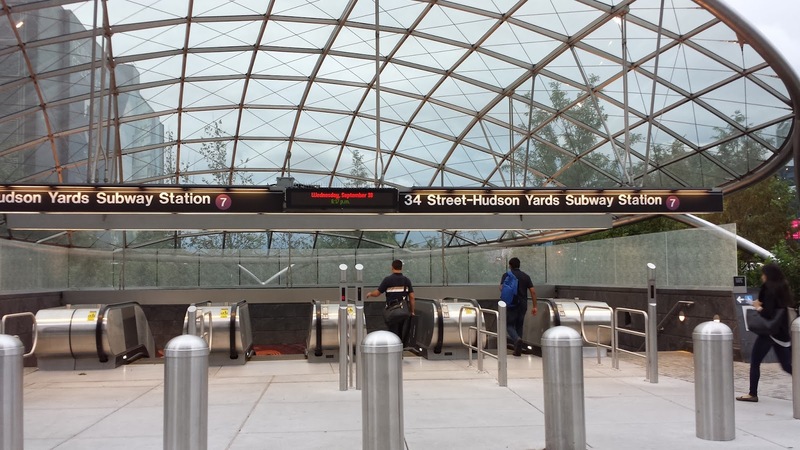 The 7 subway line is being expanded. The stop near the convention center is brand new. 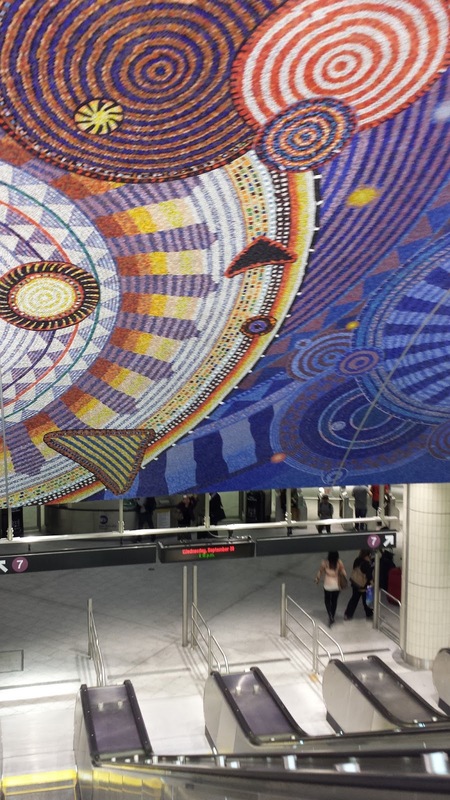 At first glance it is very different from other NYC subways. It has an open, covered, entrance way that is clearly marked. 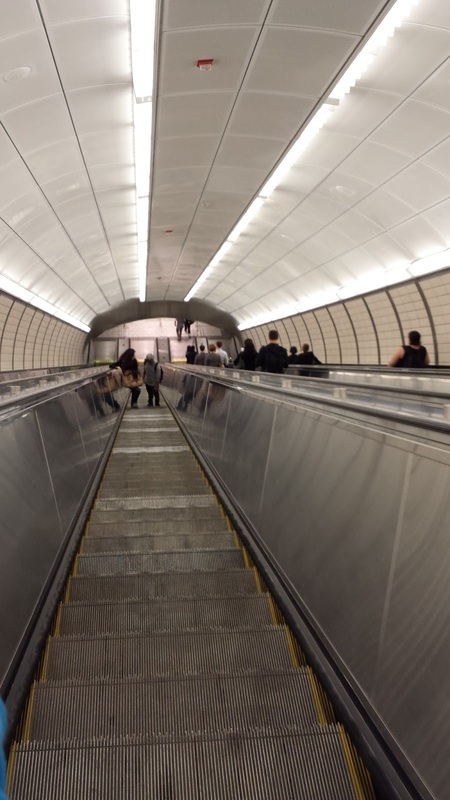 It is modern and deep with multiple escalators. It reminds me more of DC stations. 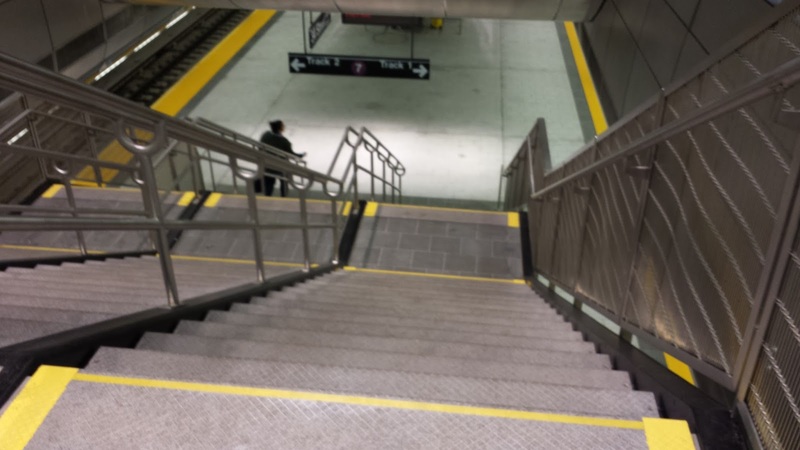 Not to be disappointed, at the bottom of the long escalator, there is still a final level change to the platform - and that transition is all stairs, even if there are many more stairways, each of which are more even and open than the old NYC stations. At the moment there is only one entrance at street level and 8 escalators - 2 up, 2 down in each of 2 "tunnels" beyond the fare turnstiles. All of this is at one end of the platform. The construction areas at street level show another entrance being built a block away that I am guessing is at the other end of the platform. That new entrance will give slightly better access to the convention center as well by being both a bit closer and with one less major road to cross. I do not know if there will be any direct access to the convention center. It would be but I am not sure how possible it is. The Whole Foods was busy all week, as usual. The one on 23rd street, near the hotel I stay at, has no seating. In the evenings, the crowds and chaos is disturbing. With a conference instead of a class, I was able to experience the mid-week, mid-morning quiet and also the 10pm ease of checkout. The lack of seating is what sent me to Columbus Circle for my late afternoon meal. Since I opted for hydrating fluids with my salad, I ate out in the modern main eating area. Maybe sometime I'll eat back in the pub. They did have a cider on tap. I had started to learn of several places to eat in NYC, even with the Gluten Free diet Then I had to give up dairy. My online searches for suggestions come up pretty slim to begin with and then it turns out most of those posts are over 5 years old and half the restaurants are now closed. There are several bakery type locations but I really do not need the calories. And there are some vegan options but dairy free does not have to be vegan. You would think I could find a kosher deli that can make a good sandwich with either no bread or with GF bread. The search will continue, meanwhile I keep falling back to the safety of labeled items at the Whole Foods. One place on the list and still in existence is Friedman's with several locations. I had a B.L.A.T. at Chelsea Market one evening. It was a very good sandwich though over priced. I know this is NYC but still, the markup fro GF free bread substitution is one of the higher ones I have seen. The market is a nice place too.